BOND girl Olga Kurylenko is full of praise for Russell Crowe. The Quantum of Solace actress stars opposite Crowe in his directorial debut, The Water Diviner. The French/Ukrainian beauty told APN Crowe was mesmerising in front of the camera and was a steady hand behind the lens. 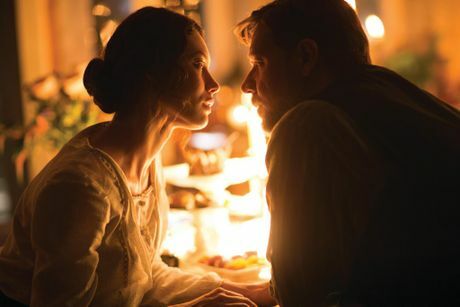 Kurylenko plays widowed mother Ayshe, whose son Orhan invites Crowe's character Joshua Connor to stay at their Istanbul hotel while he is in Turkey searching for the fate of his three sons who fought at Gallipoli. "In the beginning there's a great hostility," she said. "He's the enemy… but there's this similarity of their losses. "The moment she realises what Connor is looking for and his reasons for being there you can see there's this understanding suddenly of what's going on. "What they've gone through brings them closer, and of course he really gets along with her son." The post-First World War drama also stars Jai Courtney, Ryan Corr, Isabel Lucas, Yilmaz Erdogan, Michael Dorman, Damon Herriman and Dan Wyllie. The Water Diviner opens on Boxing Day. Read more of Seanna Cronin's chat with Kurylenko in Saturday's Weekend magazine.